I've been really busy working on the house, so no postings in a long while, but now I'm back! A passive house is practically airtight, so a whole house ventilation system is needed to assure the indoor air quality. Quoting Wikipedia, "indoor air quality can be affected by microbial contaminants (mold, bacteria), gases (including carbon monoxide, radon, volatile organic compounds from rugs, furniture, paint, etc. ), particulates, or any mass or energy stressor that can induce adverse health conditions. Indoor air is becoming an increasingly more concerning health hazard than outdoor air. Using ventilation to dilute contaminants, filtration, and source control are the primary methods for improving indoor air quality in most buildings." Generally the outdoor air is healthier than the air in your house. For residential use, 60% of the air in the house should be exchanged with fresh air every hour. However, if the exhaust air is at 68 F and the incoming air is at 40 F as is typical for the winter in Port Townsend, ventilation results in an appreciable energy loss. 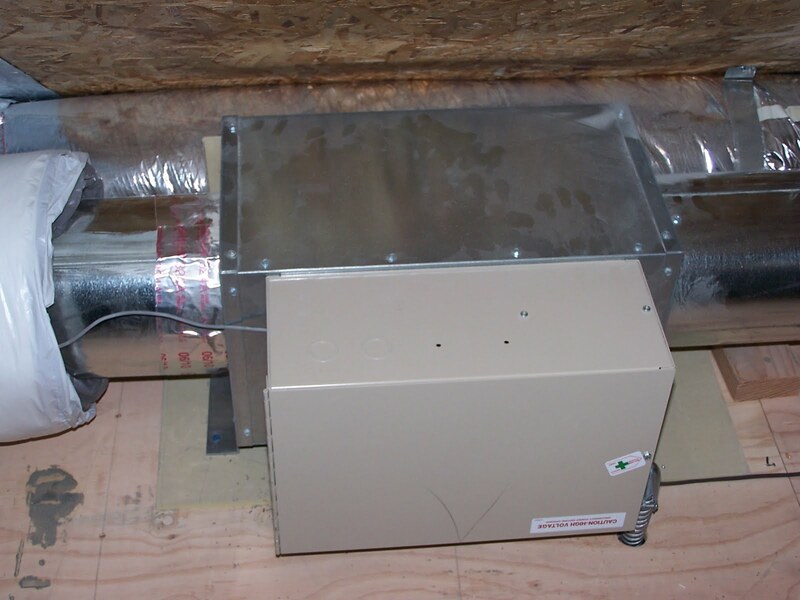 The remedy is to use an energy recovery ventilator. The heart of an ERV is an enthalpy wheel shown above. It is a wheel of about 20" diameter and is divided into pie segments. Each segment is both an air filter and a heat storage medium. 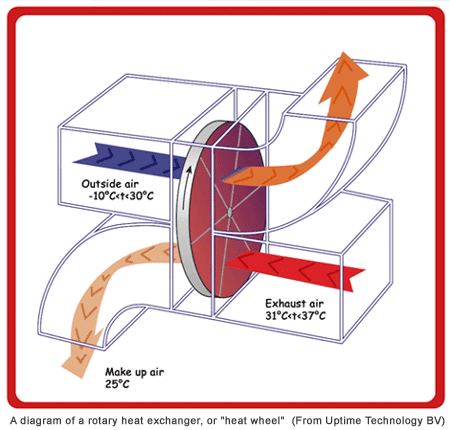 In the picture, the warm exhaust air goes through a pie segment and transfers heat to it so that its temperature increases. The wheel turns, and the warm segment is now in the path of the cold incoming air. In passing through the segment, the air is warmed up and the pie segment is cooled. Pretty simple heat exchanger: the air exiting the house gets cooled before it leaves, and the incoming air gets warmed before it is distributed in the house. I used a Recouperator made by Ultimate Air, which claims an efficiency of 90% - that is, 90% of the energy in the exhaust air gets transferred to the incoming air. The picture below shows the unit (second picture). The aluminum foil covered box to the right bottom brings in the incoming air. It is well insulated to keep from cooling down the mechanical space. The vertical black pipe on the right goes to the exhaust vent on the outside of the house. The black flexible ducts on the left of the unit bring exhaust air into the unit and send air out into the house. 8" ducts necking down to 6" ducts pull air out of the kitchen, 2 bathrooms, and the laundry area. Corresponding ducts send air into bedrooms and the living room. 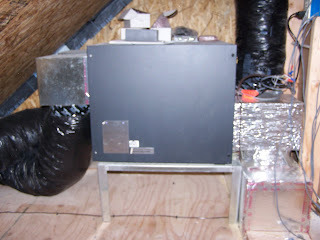 The top picture shows the "furnace" and is the only heating unit in the house. It is a galvanized box roughly 20" x 10" x 10" which contains a 2.5 kW heating element. The tan box in front f it contains control electronics. By comparison, a typical oil filled radiator is rated at 1.5 kW. The good news is that this is a pretty small furnace. The bad news is that this is a pretty small furnace. It takes about an hour of operation to heat the house one degree Fahrenheit. That is OK if the heating is under thermostatic control, and my thermostat can be controlled remotely over the internet. So, on the way back from vacation, I can bump up the heating the day before I get home. In the normal ventilation mode, the ventilator blows ~ 60 cubic feet per minute (cfm) of air through the house. In the heating mode, the blowers are bumped up to 200 cfm. In the ventilation mode, you can hardly hear the unit. In the heating mode, it is audible, but not loud. Proper ventilation is needed to prevent moisture and indoor air pollutants.So it is necessary to have proper home ventilation for creating a fresh air .Make a proper decision of the placement of window fans if needed. Your post either have got quality knowledge you did some great research. Thanks for this excellent post.